India is currently going through what some refer to as a ‘startup boom’. Be it e-commerce, healthtech, education, hyperlocal services; startups are sprouting up everywhere. Although the legal sector has not seem that many startups as compared to other fields, there have been some spectacular companies which have changed the way law is practised and learnt in the country. These startups make the right blend of law with technology, thus allowing the legal field to keep up with changing times. MeetUrPro offers a myriad of services relating to business, tax, property transaction, business incorporation. You can choose among various service packages according to your budget. They also provide accounting and taxation services; rendering their website as a one stop shop for all your needs. Vakilsearch prepares legal documents for your company, both online and offline. Various other services like Trademark and Patent registration are also offered. IndiaFilings provides similar services as VakilSearch, i.e. registration of companies, preparation of legal documents and Intellectual Property related help and has become extremely popular in the recent past. On an average, it helps in the incorporation of over 400 companies and filing of 900 trademark registration each month. iPleaders plans to make legal education more accessible to the populace. They run an Online Business Diploma Course from National University of Juridical Sciences, Kolkata. Along with that, they provide Bar Coaching and training for enforcement of anti-sexual harassment rights. Lawctopus is India’s largest law student oriented website. It is to go to website for everything related to law school life; be it internships, moot court competitions, paper submissions, career opportunities etc. They recently launched ‘Academike’ , their very own law journal and knowledge center which provides students a chance to publish their projects. Founded in 2007, Vahura provides job opportunities only for the legal field. Lawyers can upload their CV’s online which are then used by the firms/recruiters who approach this website to recruit their legal team. You didn’t mention http://www.ruly.in ? Hey. Thanks for taking out the time to read the blog post. The kind of services provided by ruly are already being provided by the other startups mentioned in the post, which have been in existence for quite some time and has a large customer base. 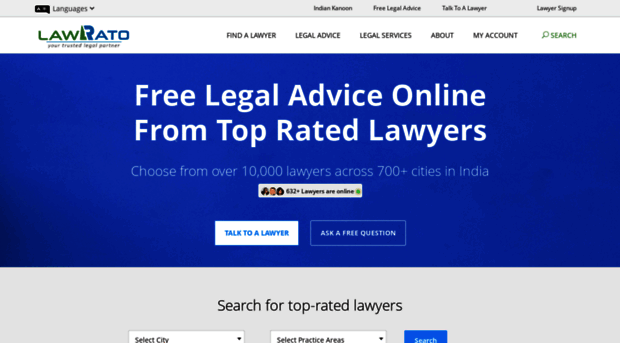 Thanks for the detailed list of legal startup in india. Thanks for the comprehensive details of legal startup business. legalsalah. com is also legaltech company where we focus on providing core litigation work along with legal investment documentation and providing legal and tax services to lower strata of the society. we are based out in Kolkata and delhi and having more than 5000+ customer base operating in 150 cities of india along with 2500 professionals team.